Gateway's old-fashioned (for laptops) look may lack appeal, but maybe it proves they don't make 'em like they used to? The NO20 is the first laptop we've seen from Gateway in the past two years, since it was acquired by Acer in 2007. It uses a familiar design, and is similar in style to Acer's previous-generation TravelMate range. The 12.1-inch screen features a matt-TFT finish, so it's easy to view on the daily commute, with fingerprints and reflections well suppressed. It's bright, but colours are washed out and lack vibrancy. It's a sharp panel, however, with plenty of space for viewing two documents simultaneously. Gateway has used most of the chassis to cram in a good-sized keyboard. Unfortunately, although the main keys are all large, some of the peripheral keys are smaller, which can make it tricky to keep up a quick typing rhythm. Quality is good, however, with each of the keys firmly attached and moving quietly. It's a theme that runs throughout the sober chassis – the design may not appeal to consumers, but it's sturdy and capable of withstanding bumps and scratches. It also remains cool to the touch, even after long periods of use. The thick screen surround provides plenty of protection for the display and, weighing 2.1kg in total, it's also a highly portable machine. Money may have been saved on the design, but there are definitely no such compromises when it comes to performance. 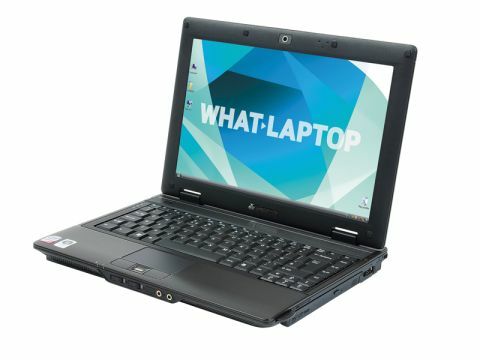 A high-end 2.66GHz Intel Core 2 Duo T9550 processor and 4096MB of memory are within the chassis, making this one of the most powerful 12.1-inch machines we've seen. Applications open quickly and it can match larger machines in terms of everyday performance. Multimedia performance is less impressive, as an integrated GPU is used to conserve power. It's capable of basic office tasks though, and we had no trouble editing photographs or watching films. Excellent mobility is provided by a 12-cell battery, which lets you work on the move for up to 475 minutes between charges. Three USB ports make it easy to connect peripherals, although two are situated too close together. A 250GB hard drive offers good storage space, with a tri-format DVD rewriter for backing up data. There's also a memory card reader, so you can access photographs from most popular digital cameras. The latest networking features are provided, with both 802.11n Wi-Fi and Gigabit Ethernet included as standard. The dated design may place the N020 on the back foot, but, helped by the sort of performance that few laptops can match, it remains an interesting proposition. If you need powerful office performance, all-day battery life and can overlook the flawed keyboard and steep price, then this may be the machine for you.